Saturday at Creation’s Las Vegas Star Trek convention was the day many fans were waiting for – the Next Generation cast reunion. While the reunion was the staple of the day, there were many other exciting guest appearances, including Anthony Montgomery (Travis Mayweather), Ron Moore (writer and producer) and Dr. David Williams, a scientist with NASA’s Dawn Mission. Montgomery was vivacious and entertaining when he took the stage in the morning. Since Enterprise went off the air, he has settled down and is now married with two kids, a son and daughter. He also announced he is working on launching his own sci-fi universe, Miles Away. He plans on having the franchise include graphic novels, the first of which he previewed this weekend, feature films and a cartoon for children which will feature important lessons and morals for children. “I need kids to see outside of their own box,” he said. Montgomery said the main character will be a black youth, but it’s not a “black story;” he said it is a story of self-discovery. “The goal, like Gene Roddenberry, is to open up your spirit to realize your potential you didn’t even know you had,” he said. Montgomery also discussed his hip-hop album he released in 2008, which he related to Will Smith’s positive rap, and discussed a new independent film he is working on called “Cherry,” which is a suspense thriller about seven strangers who wake up mid-flight with no recollection of how they got there. 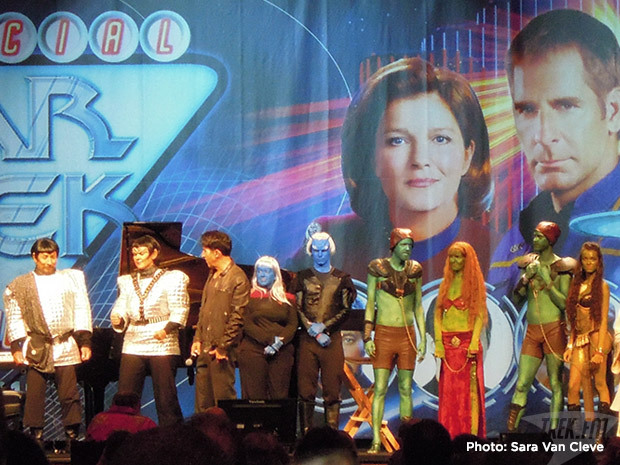 As Williams spoke about science fact, science fiction came to life as 884 fans in costume gathered in the secondary ballroom in an attempt to beat STLV’s own world record set last year for the most Star Trek costumed fans in one place. Unfortunately, fans fell short of the goal of 1,041 to set a new world record, but will try again next year. Costumes ranged from basic Starfleet uniforms from all the series to several crystalline entities, from Harry Mudd and his android wife to Mr. Data with Spot. Unique costumes included Vasquez Rock hats with Kirk and the Gorn on them, an alternative-uniformed Kirk covered in tribbles, a space hippie, gangsters from “A Piece of the Action,” Andorians, Xindi, Vulcans and more. As the fans exited the world record attempt, many made their way to the main theater for the event they had been waiting for – The Next Generation onstage reunion. Adam Malin brought out each guest on the main stage banner, which included Michael Dorn, LeVar Burton, Marina Sirtis, Gates McFadden, Colm Meaney and Jonathan Frakes. Then came out Brent Spiner after Frakes peeled off a sticker of his face covering Mr. Data’s. Frakes then proceeded to put the giant sticker on the podium so two Rikers could still look out at the audience. Before any questions, Sir Patrick Stewart made an appearance via Spiner. Spiner gave his best Picard impersonation when Malin said he sent his regards for not being able to make it, and he pretty much got his voice spot on. Malin then asked the cast about each of their TNG audition processes. Frakes said they originally wanted Billy Campbell before he was chosen; Sirtis said she had to wait for McFadden to accept her role because if she didn’t, another British actress would have been cast as Dr. Crusher and Sirtis wouldn’t have been cast; Meaney said his unnamed role as transporter chief evolved into O’Brien after a few episodes. One day he saw there was a new character named O’Brien and he didn’t know who was playing him. Then he found out he was O’Brien. When Malin asked Frakes about the emotional arc Riker had through the series, Frakes showed the audience Riker in a nutshell. He then went from one side of the stage to the other doing Riker’s famous left shoulder-led walk. That was only the first of the cast’s display. McFadden did a tap dance, living up to the “Dancing Doctor,” and Burton did a famous barrel roll when Malin asked the cast to describe their characters in one word. The cast also spoke about their current and upcoming projects, and one of the most exciting is a feature film based off a video game featuring Sirtis as the queen of the gypsies and Dorn as Fane the werewolf. They couldn’t yet say what the game is the movie will be based on because of licensing issues, but based on knowledge from gamers I know, it’s believe to be Skyrim. The panel was filled with laughter and good times; it was clear the cast truly likes each other to this day and, with as much silliness that ensued, fans were probably wondering how this cast was able to film seven whole seasons. The winner of the special TNG 25th anniversary contest was a female version of Shinzon, with an authentic shaved head and handmade costume. Third place went to a woman wearing a handmade version of Dax’s wedding gown from DS9; second place went to a Hirogen Borg from Voyager; first place and $1,000 went to two fans dressed as block versions of a Hunter and Tosk from DS9. Following the costume contest was a special concert by Avery Brooks. Canadian pianist Andy Milne also played and accompanied Brooks on stage, combining talents to create a wonderful performance of smooth jazz. After Brooks’ performance, Captain’s Chair and Gold fans went to the secondary theater for ice cream and a performance by Tim Russ and his rock band. Russ proved that Vulcans rock. Tomorrow is the final, but perhaps most exciting, day of the convention as four of the five captains convene on one stage.